Lexus operates with the firm belief that hybrids are better than battery-electric cars, but there's at least one thing about electric-car maker Tesla Motors it wants to emulate. Even as Toyota's luxury division has lashed out at electric cars in recent ads, its executives are intrigued by Tesla's direct-sales model. 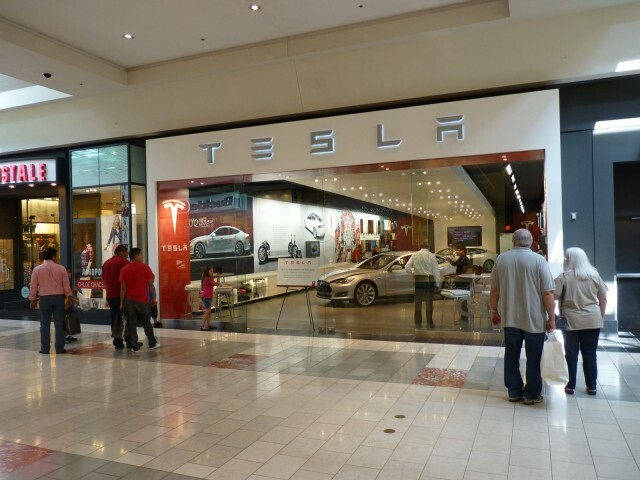 Lexus U.S. chief Jeff Bracken thinks Tesla's strategy of operating company-owned stores in shopping malls is "a clever one," and explained why in a recent interview with auto industry trade journal Ward's Auto. Lexus executives believe Tesla Stores are helping to attract younger buyers, who Lexus feels are particularly disinterested in visiting traditional franchised dealerships. Gen Y buyers reportedly do more research before visiting a dealership, and tend to be younger than the salesperson servicing them. That is thought to contribute to an uncomfortable experience, whereas Tesla's mall stores may constitute a lower-pressure environment. The electric-car maker's store staff don't work on commission and--at least as long as electric cars remain a new and mysterious item to most consumers--they prioritize offering information along with encouraging serious shoppers to buy the car online. Of course, Tesla's model has been met with fierce opposition from auto-dealer associations in numerous states, which has led to outright bans on direct sales in some. Lexus isn't discussing any concrete plan for mall stores of its own. But anything it intends will keep dealers as "part of the solution," Bracken said. One potential arrangement might involve using mall stores as a form of advertising, hooking potential customers who could then be directed to a traditional Lexus dealership to buy the actual car. Regardless of any future experiments, Lexus seems to be viewing Tesla more as a legitimate rival than it previously did. And it's not alone among luxury car makers. Earlier this month the brand's U.S. marketing chief, Brian Smith, told Ward's that robust Model S sales are one reason why sales of the Lexus LS full-size luxury sedan have declined. However, LS sales have been down for some time as the current model is older than much of the competition. It received a facelift for the 2013 model year, but was last fully redesigned for the 2007 model year.